The natural evolution of the Sun made it progressively more luminous during the Archean and Proterozoic eons; the Sun's luminosity increases 6% every billion years. As a result, the Earth began to receive more heat from the Sun in the Proterozoic eon. However, the Earth did not get warmer. Instead, the geological record seems to suggest it cooled dramatically during the early Proterozoic. Glacial deposits found in South Africa date back to 2.2 Ga, at which time, based on paleomagnetic evidence, they must have been located near the equator. Thus, this glaciation, known as the Makganyene glaciation, may have been global. 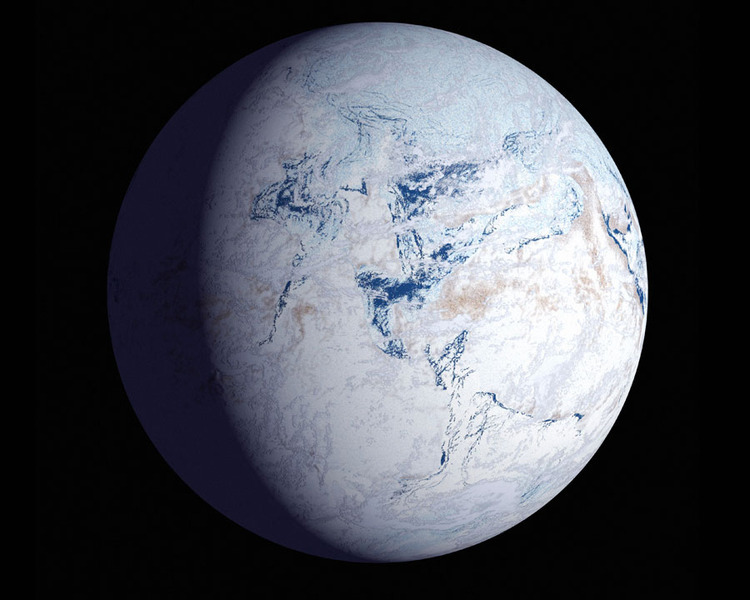 Some scientists suggest this was so severe that the Earth was totally frozen over from the poles to the equator, a hypothesis called Snowball Earth. However, the term Snowball Earth is more commonly used to describe later extreme ice ages during the Cryogenian period. There were four periods, each lasting about 10 million years, between 750 and 580 million years ago, when the earth is thought to have been covered with ice apart from the highest mountains, and average temperatures were about −58 °F (−50 °C). The snowball may have been partly due to the location of the supercontintent Rodinia straddling the Equator. Carbon dioxide combines with rain to weather rocks to form carbonic acid, which is then washed out to sea, thus extracting the greenhouse gas from the atmosphere. When the continents are near the poles, the advance of ice covers the rocks, slowing the reduction in carbon dioxide, but in the Cryogienian the weathering of Rodinia was able to continue unchecked until the ice advanced to the tropics. The process may have finally been reversed by the emission of carbon dioxide from volcanoes or the destabilization of methane gas hydrates. According to the alternative Slushball Earth theory, even at the height of the ice ages there was still open water at the Equator.